Sometimes, i get a good feeling! Top: Asos. Pashmina: Vintage. Skirt: Ebay. Hello long new maxi skirt.. i bought three of these beauties for £3.99 each, they're going to be every worn every day once i've had my operation considering jeans/tights/leggings will be a major no-no as it'll hurt too much. And as comfortable as tracksuit bottoms are, i'd still like to be a little fashionable haha! 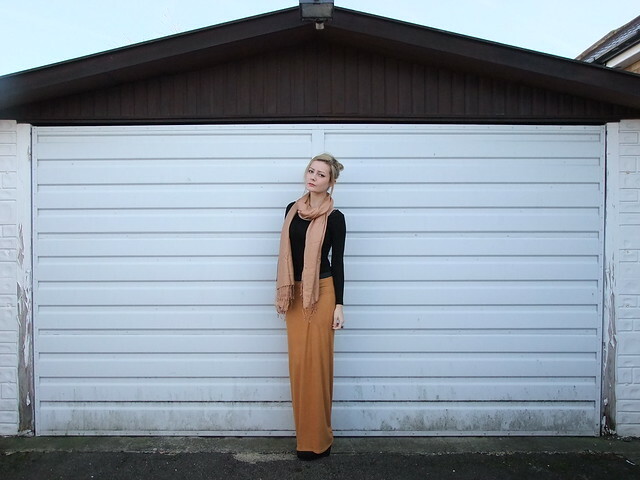 This skirt is actually mustard coloured, not that these photos portray that too well though. So, this pashmina was my nan's, it was at the back of my mums wardrobe, un-opened and i knew she had it for years, so im assuming it's vintage, even if it's not, i couldn't tell you where its from, i just know she purchased it while in the Middle East. I feel proper upperclass in these photos. I'm wearing wedges from New Look but you can't see them in these photos. Feeling pretty positive at the moment, after therapy i realised so much. My new therapist is amazing, she's really helped me and i weent in feeling so bad and came out feeling real good actually. Going for a soy hazelnut latte afterwards definately enhanced my mood. While waiting for my starbucks i was standing next to Eastender's Max Branning, who looked me up and down and gave me a wink.. lucky me haha. *Title: Flo Rida - Good Feeling. WAY gorgeous! love your skirt! What an elegant and gorgeous outfit. I love that it's simple but works so well on your lean frame. Oh wow the maxiskirt looks stunning on you!